Left and Write: F: Falcon! The Falcon was created by Stan Lee and Gene Colon in 1969 and holds the distinction as the first African-American superhero in mainstream comics. Samuel Wilson was born and grew up in Harlem. A rebellious youth, it took the death of his parents to make him leave New York and move to Los Angeles. There he becomes "Snap" Wilson, an up and coming criminal. While on his way to Rio De Janeiro for a "big deal", his plane crashes on a place called Exile Island. The island isn't deserted, though, it's been taken over by the Nazi supervillain....The Red Skull. Sam comes across the natives, who are in hiding, as well as large falcon he calls Redwing. Sam develops a good bond with Redwing and they meet up with a certain Star Spangled Avenger....Captain America. In the ensuing showdown with the Skull, Sam is blasted by the Cosmic Cube (a device of considerable power) and is mentally 'fused' with Redwing. The fusing effect strengthens the connection they two already had and, eventually, would give Sam wide power over any bird. With help from the Wakandan king T'challa (also known as the Black Panther), Sam gets a 'flying harness' which....you guessed it....allows him to fly. With combat training from Captain America, he fashions a costume and becomes Cap's crime fighting partner. Thanks to Captain America, Sam is a trained hand to hand combatant as well as a natural trainer of birds. 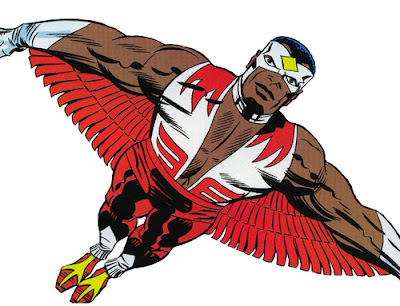 A natural leader and free thinker, Falcon also is just as comfortable in a team dynamic. 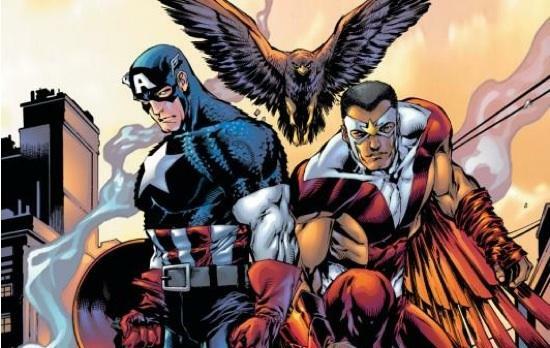 Cap and the Falcon fought crime alongside each other for quite a few years. Sam even took on the mantle of Captain America a couple of times when the Captain was thought to have been killed. Sam is still flying high in the Marvel Universe, as far as I know. Guest starring in various other books and even getting his own mini-series back in the 90s. Head on back over here Monday for a hero of colossal proportions! Falcon is truly a piece of comic book history. And he fought alongside the Cap? Awesome. Since Captain America is my favorite, I think Falcon is pretty cool. It would be very interesting to have him in the next Captain America movie! Which I'm very excited for! Too bad we have to wait so long. Cool! His seems like a good character. I remember reading about an early African American comic book character who was not a well-done character, and was actually fairly offensive, if I recall correctly. I wish I remembered his name, but I don't. Glad to hear this one's still around. I didn't know he fought with Captain America! How awesome! 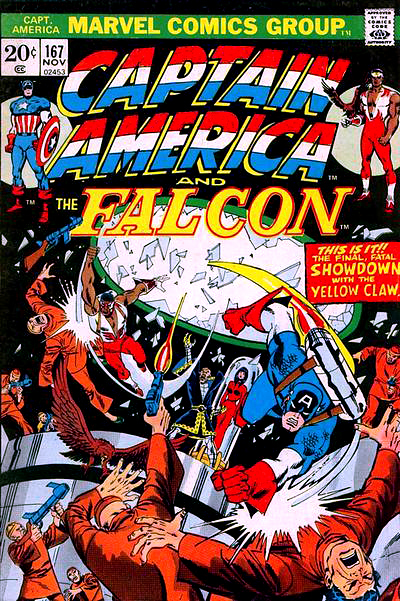 I never knew that there was a superhero called 'The Falcon' fighting with Captain America. He's an interesting sounding hero. At first I thought you were writing about a car. There were so many crime fighters, why is the world now in such a pickle? I've always wanted to fly. It might even be worth wearing that horrible outfit for. 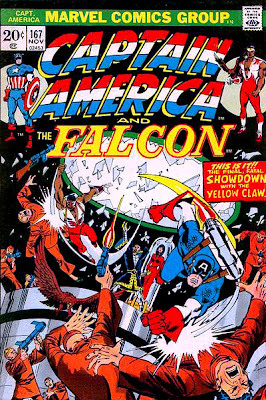 Here's hoping the Falcon makes an appearance in the next Captain America movie! Falcon has a great look. I've really enjoyed getting to know these guys. Any girls coming up? @Sheena: I agree and I think he was one of the more underused characters. @Imogen: Yep, he was pretty interesting, for sure. @Regina: I have a few coming up, but not until "M". I don't remember the Falcon, but then I barely remember Captain America. I guess I just didn't read enough comics, sigh. Fun information to have and share with my grands. Too bad we don't have super heroes now. Thanks for being on the A to Z support team. They could do something neat with a loyal friend for Cap, given that the villain is probably going to be a friend who's no longer loyal. I'm always surprised at how many fans Falcon has. He's really had a resurgence in the Millar/Bendis era. I am a Stan Lee fangirl, through and through. I'm mad about just about everything he has ever done. I just think he is the shiz! I know that one, I know that one! At last one hero I did see at least once. I was beginning to feel like the dumb of the class, hahaha. that is so cool! I love the story of how Falcon came to be. it would almost be like becoming one with your patronus. I didn't know his back story though. That's pretty cool that he's super involved with Captain America. I hope he's in the next movie! I wonder if they will make the next Marvel hero movie based on him? This is my favourite hero story from your A-Z postings so far! I'm intrigued. Does Redwing travel around with him? Power over birds seems like it would be super useful. i read that falcon is in the next captain america film, he was cool enough to have his own mego action figure... those were the coolest. Some fellow, who wished to remain anonymous, gave up his collection of 60000 comic books to an auctioneer in Vancouver this past week. I'm not when it begins, but can you imagine? He's been collecting since he was 5 years old. It we weren't 700 klicks north, we'd go. Great post, Mark. As a kid I don't think my brother or I realized the significance of the Falcon. Sounds like a great character and it's good that he was well presented as an African American. Never knew there were so many superheroes out there! It sounds like they could make Marvel superhero films for years. So cool. I will be looking forward to seeing that! How many people will think it's a new idea, a sign of the times? I'm delighted to know all this history. I'm also glad that Marvel brought out a black superhero in '69. But doesn't it seem a little weird that he was a criminal who went straight? Seems kinda un-pc to me. Falcon is pretty awesome. I love his outfit, too. Those wings are super cool. Another great post! It must be exhilarating to fly like a bird. I had no idea there were so many different superheros! @John: I know what you mean. I've been a Falcon fan since way back when Cap shared billing with him on his own book. @Trisha: Me too and I hope that rumor is true. @mshatch: Haha...very true. Nice analogy. @Jianne: Thank you and nice to meet you, too! I really like Falcon and I never saw any of the cartoons! How can that be? @Allison: Can't say I blame you...he's a pretty cool characters. Yes, from what I've always seen, Redwing is pretty much around all the time. @Jeremy:That's right, almost forgot about the action figure...it was very cool, as well. @Joylene: Thanks and, wow, 60K comics? I can only imagine what he had in there! @Nick: Oh yeah, there are a ton of them :) 26 isn't even scratching the surface. @Nancy: I think you're right "Snap" was pretty stereotypical, but those were different times, too. @Shell: Thanks and I agree....I wouldn't mind giving that harness a try! @Carol: Oh, there are tons of them, for sure. I hope he is in the next Captain America movie. He sounds like cool hero. WE LOVE Captain America !!! and therefore, we LOVE the Falcon! I take it this Falcon dude had no need for a car. As in a Ford Falcon. There you go, a brief comment. This guy seems really cool. I love the first pic. It would be great if he is included in the next movie. I feel like I am really learning some things about the Comic Universe. I hope that you are right about The Falcon being in the next movie with Captain America... I will actually know the Backstory thanks to you. How awesome is this! I absolutely love your theme! @Jean: Thank you very much! @Carrie: Haha...most wouldn't, I'm sure. Oh my gosh, Falcon is going to be in the next Captain America movie? YAY! Okay, it's just a rumour... I'd better not get my hopes up too high! Mark, you are determined to make me go to a comic book store, aren't you? I love this! You're theme is awesome and these characters are awesome. I can't even wait for this movie. I'm already going to be in line for Iron Man. Love it! @Suzie: I know what you mean...I'm hoping, though! I never would've guessed that there were so many heroes I didn't know about. I don't remember the Falcon, but I loved Captain America. I'm African American. An African American superhero is cool. Thanks for the education. They need to put Falcon in the next Avenger movie. Wonder who could play him? I'm so ready to see the Falcon in the next movie!!! That would be awesome. Anthony Mackie just might be handsome enough, because you have to admit, the Falcon in the comics is one HANDSOME dude!!! Anthony needs to be a little more "manly" looking to live up! I knew about Falcon but I didn't think he had such a pivotal role as being Capt America a few times. I would definitely look forward to his appearance in the next movie.